In this Post, I will show you how to create and manage Enterprise Custom Fields in MS PROJECT SERVER 2010. First of all, why do you need those fields? The answer is simple: To suit your needs! Let’s suppose that you need to track information about cost center! Where can you enter this cost center? In the custom field! As you can see there are several default custom fields (twenty of them)! This is only the first part of the screen! In the Name field I will put the name of this custom field. In the description field I will enter description of thist field. 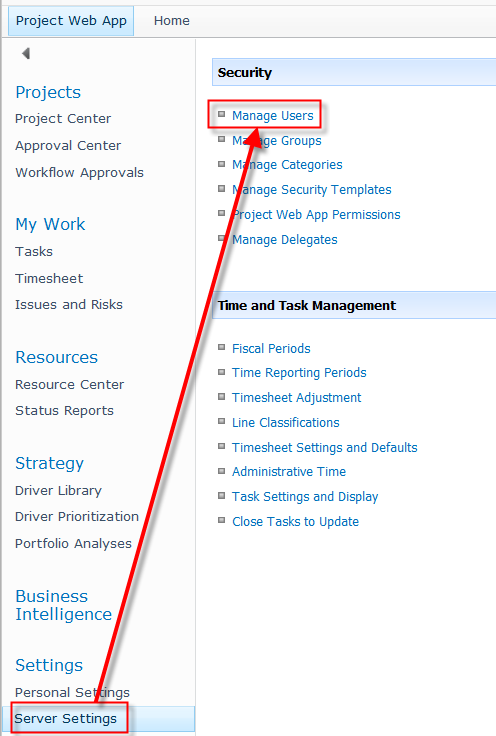 In Entity field I can choose: Project, Resource or Task. 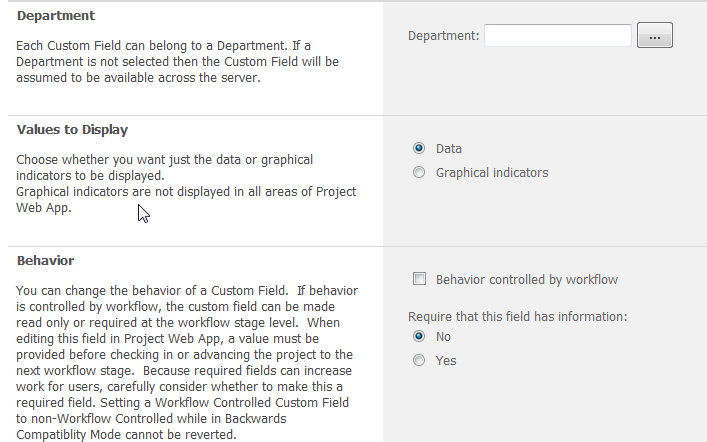 If I choose Project, this custom field is applied to the PROJECT LEVEL. Text – You can enter whatever you want here! Multiple lines of text – you will choose that if you want to enter multiple lines of text in this field. 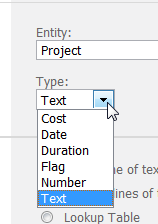 If you choose that, you will not see in Project information Tab in MS PROJECT PROFESSIONAL 2010! Lookup Table – is available with Text type! I will explain usage of Lookup Table in my next Post! Formula – if you want to use a specific formula which you can define for this custom field. I will explain this in one of my next Posts. 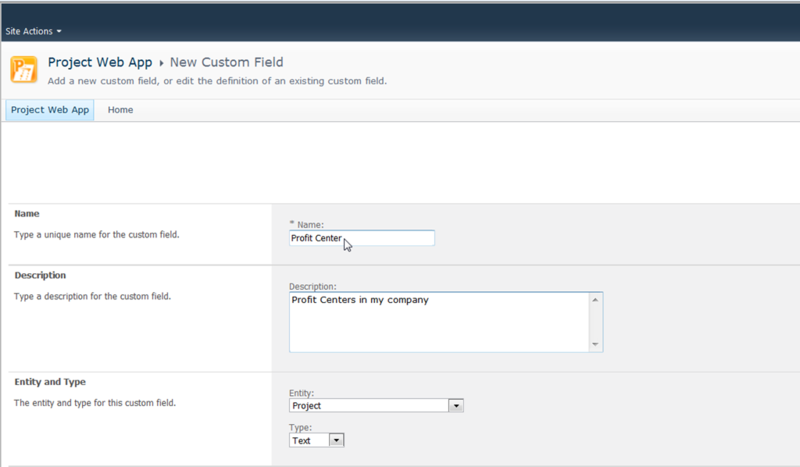 In Department field if you department, then only users which belongs to that particular Department will be able to see this custom field. If you leave this field empty, all users will see this custom field! Require that this field has information – If you select Yes than this field can not be blank, and you will have to fill it! Be careful with that! For my example, I will choose Resource entity and Text type, because I want that every Resource belong to Profit Center, no matter on which Projects or Tasks will they work on! I will also make this field as Required! I can not do it, because this custom field is required! The conclusion? 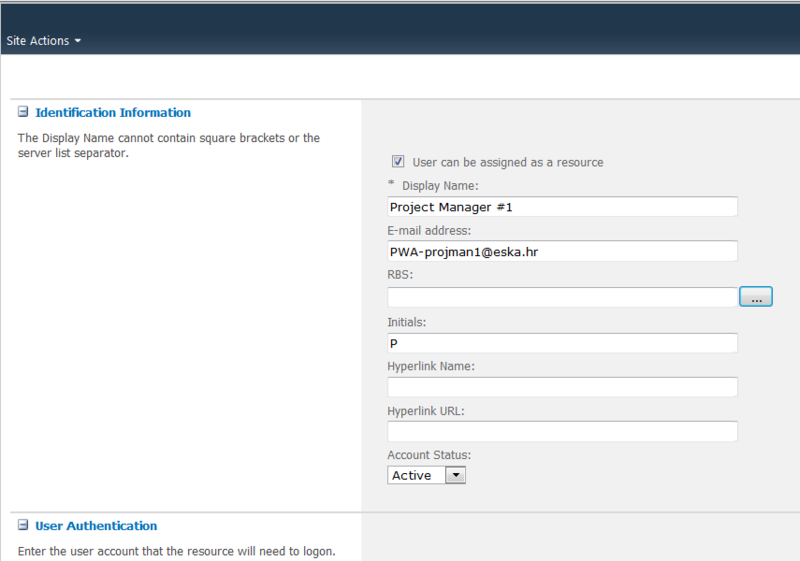 BEFORE you start to add your resources, tasks, or project, first define, and crate your custom fields. In my case, I should go from one resource to another, and fill this field, which can be very annoying! So I will put, for example, abc123 in that field! and I will save it! It works! But you will say: “YOU ARE MORON! What does abc123 mean?”. It means nothing. I just show you that in this type of custom field I can put whatever I want! Of course if you have predefined Profit Centers in your company, you should use a lookup table! How? Read my next Post! This entry was posted in MICROSOFT PROJECT, Microsoft PRoject 2010, Microsoft Project Server 2010, MS PROJECT 2010, PMI, PRoject Management and tagged Microsoft Project 2010, Microsoft Project Server 2010, Microsoft Project Server 2010-Enterprise Custom fields, MS PROJECT, MS PROJECT 2010. Bookmark the permalink. Very helpful post. I need to create a custom field that allows a user to type a number but if the number is greater than 999, I don’t want the comma to display. Do you know how to do this?